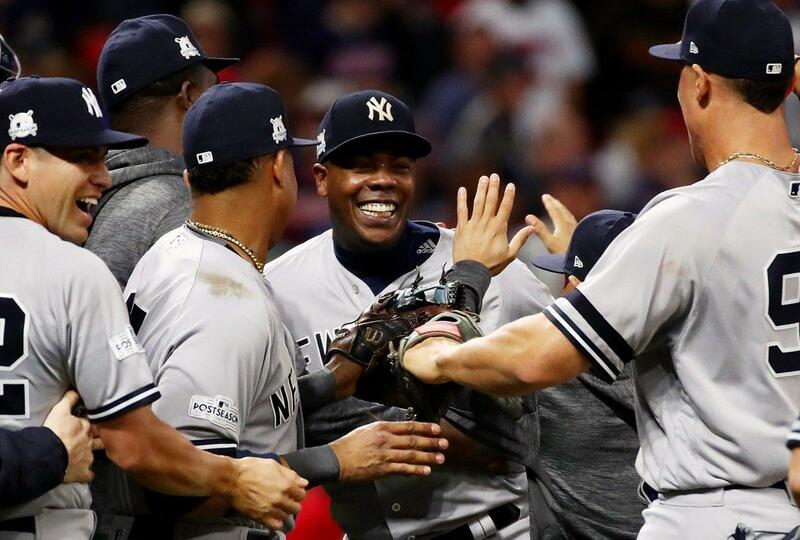 CC Sabathia pitched tremendously before handing it over to the bullpen and the bats of Didi Gregorius and Brett Gardner provided the offense as the Yankees surprised the Cleveland Indians and the Baseball World to advance to the American League Championship Series. Going into the final game of the ALDS, none of the experts were giving the Yankees a chance going against likely AL Cy Young Award winner Corey Kluber in his home ballpark. But thanks in very large part to Gregorius, Kluber didn't stay around too long. His two home runs ensured that Kluber was watching the game from the dugout by the end of the 4th inning. I am sure that's not the game plan that Tribe manager Terry Francona had envisioned. Aaron Judge, Gary Sanchez, and Greg Bird were a combined 0-for-13 with ten strikeouts, but with Didi Gregorius playing one of the greatest games in Yankee shortstop history, it did not matter. The game started with Corey Kluber in control. Brett Gardner opened with a failed bunt attempt on the first pitch to record an out. Aaron Judge struck out for the first of four strikeouts on the night for the second out. 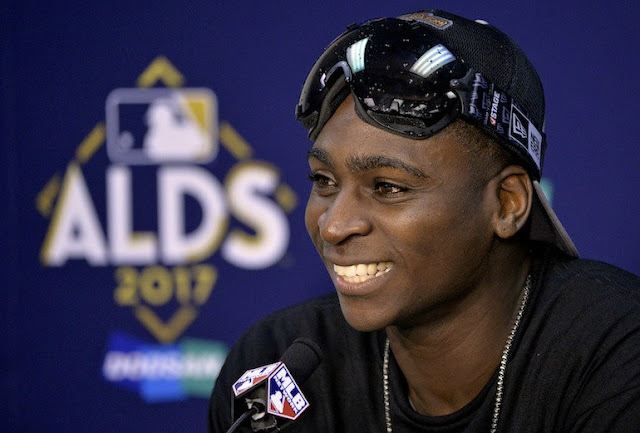 But then Didi Gregorius, who entered the game with just one hit in the series, blasted a drive into the right field seats for the game's first run. Kluber came right back and struck out Gary Sanchez and was seemingly in control despite the misplaced pitch to Didi. The Yankees had a runner in scoring position in the 2nd inning when Aaron Hicks took a two-out walk and Jacoby Ellsbury reached first on, surprise, catcher's interference (bat hit the top of the catcher's glove). 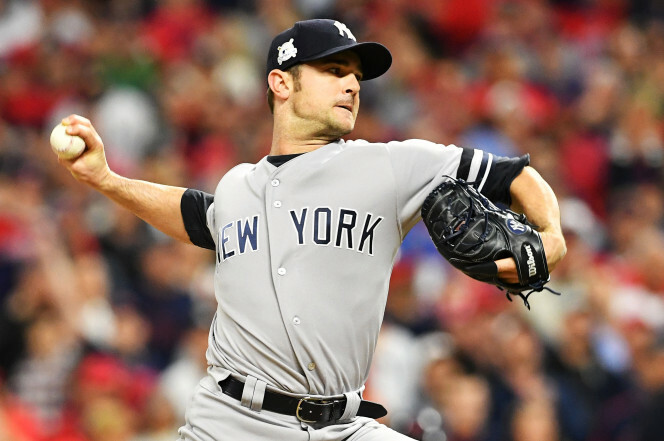 Todd Frazier flied out to end the inning and leave the runners stranded, but the Yankees were showing activity against Kluber. Meanwhile, CC Sabathia was facing the minimum number of batters with four strikeouts through the first two innings. Brett Gardner led off the top of the 3rd inning with a sharp single to right. After Judge whiffed again, Didi Gregorius jumped on another Kluber pitch and ensured it was a fan souvenir in the right field seats again. The Yankees were up, 3-0. The bottom of the inning was another three-up, three-down performance for Sabathia, with two more strikeouts. In the top of the 4th inning, Kluber retired the first two hitters but had reached three balls with both before getting a strikeout and a line out. When he walked Jacoby Ellsbury on five pitches, it was Miller Time in Cleveland. Terry Francona pulled Kluber, who left with a 12.79 ERA in this series, in favor of Andrew Miller. 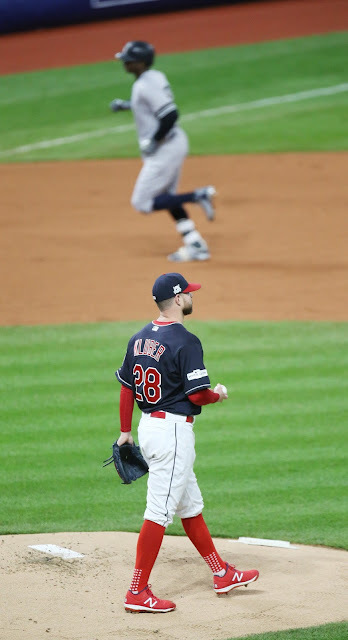 Miller struck out Todd Frazier to get the Tribe out of the inning but it was very surprising to see Kluber's exit before the conclusion of four full innings. I certainly was not complaining. CC Sabathia finally gave up his first hit in the bottom of the 4th when Francisco Lindor led off with a single through the hole into left field. Sabathia came back strong, retiring the next three batters, two by strikeout, and remained in control. He looked good starting the bottom of the 5th when he struck out Carlos Santana, but then four successive singles brought home two runs to make it a one-run game. Manager Joe Girardi wasn't taking any chances at that point and went to the pen to bring in David Robertson to face Francisco Lindor with runners at first and second. On his second pitch, Lindor hit a grounder to Didi who stepped on second and threw to first to complete the inning-ending double play. A huge defensive play by Didi to ensure that his glove was as loud as his bat. 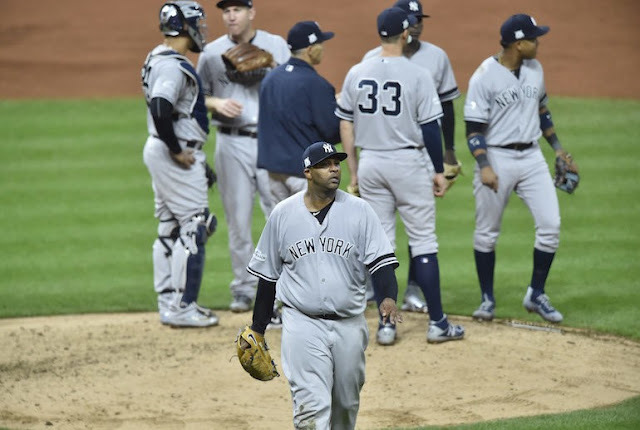 CC Sabathia may not have survived the 5th inning, but still, giving up only two runs and striking out nine batters was a tremendous effort despite the slim lead. It became a dueling battle of the bullpens as both teams put up scoreless frames through the eighth inning. The Tribe brought in their closer, Cody Allen, with two outs in the 8th (who proceeded to strike out Greg Bird), but I was very surprised...and a little uneasy...when the Yankees brought in Aroldis Chapman to start the bottom of the 8th. With so many other options available in the bullpen, I was fearful that Girardi had gone to Chapman too prematurely. 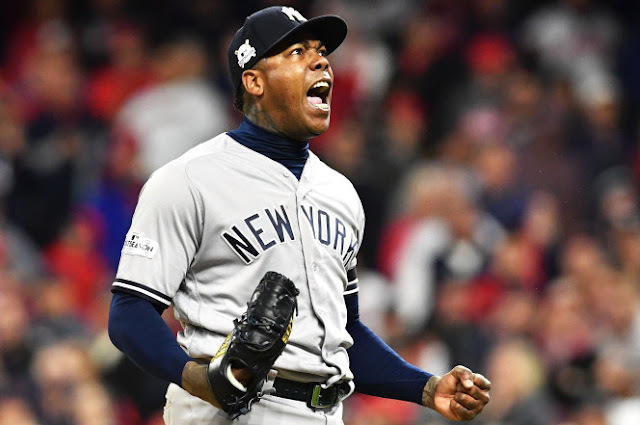 Fortunately, Girardi proved why he is the Yankees manager and I am just a blogger on this site, when Chapman recorded three quick outs on thirteen pitches. In the top of the 9th, with Cody Allen still on the mound, Starlin Castro struck out for the first out. Next up, Aaron Hicks singled to left. A fielding error by Austin Jackson, the ball rolled under his glove, allowed Hicks to move to second. Allen got Chase Headley to pop out, but then he walked Todd Frazier. Brett Gardner's single to right, just past the glove of second baseman Jose Ramirez, cleared the bases to give the Yankees two very huge insurance runs. Frazier was able to score the second run when the throw from right fielder Jay Bruce into second got past Francisco Lindor and the Toddfather was able to slide into home ahead of the throw to the plate. Gardy advanced to second on a throwing error. It was a legendary at-bat for Gardy, who battled Allen through 12 pitches before getting the key hit (the longest at-bat of the post-season). Francona made another pitching move and pulled his closer in favor of Joe Smith. Smith got Aaron Judge to ground out to third, but no matter, the Yankees had increased their lead to 5-2. A little breathing room. Going into the bottom of the 9th with a three-run lead made me feel so much better about the return of Aroldis Chapman for a second inning of work. But I did feel some tension when Chapman walked the first batter (Jose Ramirez). Chapman allowed me to exhale slightly when he struck out Edwin Encarnacion. Carlos Santana hit a ball to second for the force out of Ramirez. Two outs. The only man standing between the Yankees and a date in the ALCS with the Houston Astros was one-time Yankees prospect Austin Jackson. Carlos Santana took second on defensive indifference, but Gardy's insurance runs ensured that Santana was inconsequential. Chapman's job was simple...leave the potential tying run standing on deck without a chance to come to the plate. You could feel the excitement emerging when Chapman blew a fastball past Jackson for the called third strike to end the game. The Yankees win! I blamed Joe Girardi for the second game loss, but this game completed his redemption. 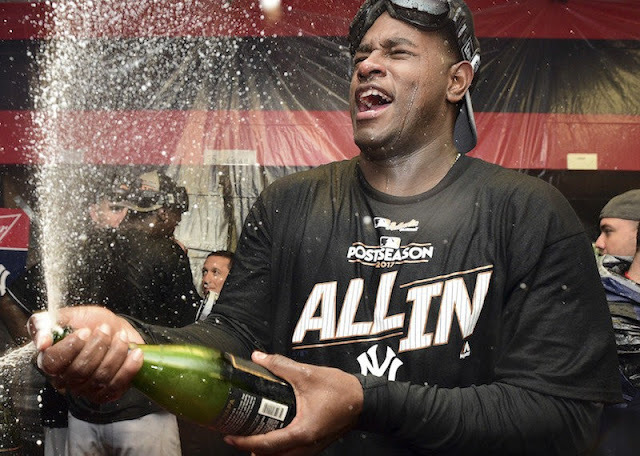 It's amazing how many people wrote off the Yankees when they lost the first two games of the ALDS in Cleveland. Even after they tied the series in New York, I didn't hear many voices giving the Yankees any chance for Game 5 in Cleveland except for maybe Alex Rodriguez. The Indians were arguably the best team in the American League, with 104 wins on the season including the two wins in the ALDS. Their season included the historic 22-game winning streak and they were nearly everyone's favorite, excluding Yankees fans, to win the World Series after their loss last year to the Chicago Cubs. But in the end, they will not have the opportunity to make a repeat appearance in the Fall Classic. 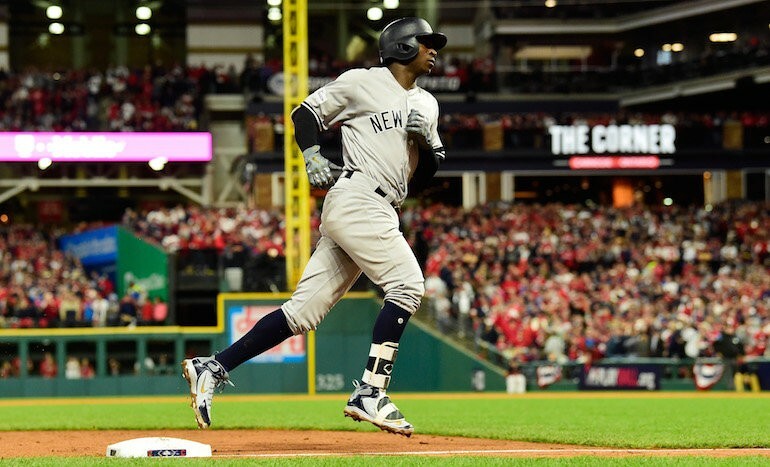 If Corey Kluber could have figured out an answer for Didi Gregorius, the results may have been very different and the Yankees might have been left wondering what could have been. Instead, the magic and the 'never-say-die' resiliency of the 2017 Yankees continues. The Yankees will get a rematch of their 2015 Wild Card Game loss to Dallas Keuchel and the Houston Astros in Game 1 of the ALCS. This time, we get seven games to show the World that heart, determination and desire, combined with a little talent, can make a difference. Congratulations to the New York Yankees! Goodbye, Cleveland...hello, Houston! Have a great Thursday! Friday the 13th, here we come! Go Yankees!